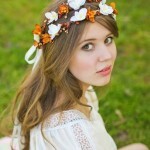 Wedding Hairstyles with Bun – Hair style adds a great deal of flavor to a woman’s look. And you need to give it extra attention on your Wedding day. In India, Bun is a traditional hairstyle for bride’s hair of all religions and cultures. 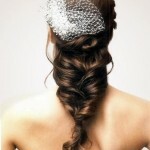 The reason behind it is very simple – bun hairstyles provide support to the heavy duppattas worn by the brides. Traditional Wedding Hairstyles with Bun: This is typical bridal hairstyle that is found in almost all Indian weddings, especially the ones in the northern region. For this up do, all the hair is gathered together and twisted to form a high bun. The bun hairstyle for wedding is then adorned with flowers (usually Jasmine), jewelry or other accessories to make it more elaborate. Soft Bun Hairstyle: Messy or soft bun hairstyle for your special day, as opposed to tight buns have been popular for a while now, and are done in different variations & sizes. The advantage with loose bun hairstyles for wedding is that they exude a soft and pretty look; it can be tied a little lower than the traditional bun and allows for creativity with flowers. Bun on The Side Hairstyle: This hairstyle is a variation of the traditional bun. In this style, rather than placing the bun high on the head, it is moved to the side. For this hairstyle, thoroughly blow dry the hair, comb it straight and pull it into a low puffed up bun, onto one of the sides. This hairstyle will look great on brides who have well defined cheek bones or big prominent eyes as it highlights those features. Traditional Up Do Hairstyle With a Twist: This is another variation of the traditional up do which is different but not unconventional. In this hairstyle, different sections of hair are curled and pinned up. The curls together are given the shape of a bun. This is a more stylish take on traditional bun and will go good with sarees, this could be used as an option for brides who do want to sport a bun but do not want it to look too stiff or too messy. 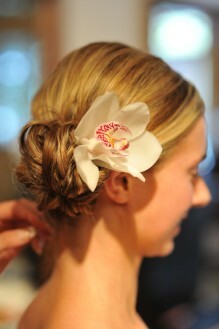 Spanish Up Do Hairstyle: This hairstyle is meant for brides who want go for an up do but not the run-of-the mill stuff. It works best on thick and long hair. For this hairstyle, hair is blow dried to give it some volume and is then parted horizontally. The upper segment of the hair is done up with elaborate curls while the other is left to flow down the back. The updo is then adorned with flowers, crystals and even bows. This bun hairstyle can be best sported by round faced brides.